While the Detroit Auto Show debut of the 2014 Jeep Grand Cherokee lineup included gobs of information including specs on the new EcoDiesel engine, the Chrysler Group declined to announce pricing at the time of the big debut but thanks to the wonders of online enthusiast communities – we have our first look at the 2014 Grand Cherokee pricing for the engine model range. The 2014 Jeep Grand Cherokee is available in five trimlines for rear wheel drive models and six trimlines for four wheel drive models with the 2014 Grand Cherokee SRT being the only trimline that is offered exclusively as a 4x4 model. The least expensive configuration for the 2014 Grand Cherokee (4x2 Laredo) carries an MSRP of $28,795 while the range topping 2014 Grand Cherokee SRT starts at $62,995 while a fully loaded GC SRT costs somewhere in the area of $73,000. These prices do not include the $995 destination charge (nor do any of the prices below) but with a spread in price that ranges from $29k to $73k – there is a little something for every prospective SUV buyer. As mentioned, the least expensive package for the 2014 Jeep Grand Cherokee is the Laredo models which start at $28,795 - $1,100 more than the Laredo models for the current (2013) model year. The Laredo comes standard with the 3.6L Pentastar V6 mated to the new 8-speed automatic transmission. Those who want just a little more out of their 2014 Grand Cherokee can opt for the Laredo E which is new for 2014 and starts at $30,495 - adding goodies like power seats, roof rails and Sirius Satellite radio. Like the base Laredo, the Laredo E is available only with the 3.6L V6 engine. The first 2014 Jeep Grand Cherokee trimline to offer optional engines is the Limited model which starts at $35,795 - $1,300 cheaper than the current Grand Cherokee Limited 4x2. The Grand Cherokee Limited comes with the standard 3.6L V6 and the 8-speed automatic transmission but for $2,195, buyers can opt for the 5.7L Hemi V8 or for an additional $4,500 (over the base price) buyers can opt for the new 3.0L EcoDiesel. Next in line is the 2014 Grand Cherokee Overland starting in 4x2 form at $42,995, which is $2,500 more than the 2013 Overland models. The Overland also derives its power from the standard Pentastar V6 but for the same upcharges of $2,195 or $4,500 – buyers can opt up to the 5.7L Hemi or the 3.0L EcoDiesel. Finally, the top of the line rear wheel drive 2014 Jeep Grand Cherokee is the Summit model that was present at the Detroit Auto Show debut and this 4x2 premium package starts at $47,995 - $3,500 more than the 2013 Overland Summit models. The 2014 Grand Cherokee Summit comes with the standard Pentastar engine as well but this top of the line package comes with a higher price for the optional engines. The 5.7L Hemi will add $2,695 to the MSRP of the Summit models while the new diesel V6 costs $5,000. The Grand Cherokee Summit models are loaded enough that there are only a few options like the $95 engine block heater, the $995 Mopar Chrome Edition group or Exterior Appearance group and the $1,995 rear entertainment system package. When it comes to the trail rated four wheel drive models, the trim packages follow the same path with the exception of the high performance 2014 Jeep Grand Cherokee SRT. The 5.7L Hemi is available for the Limited and Overland models for $2,195 ($500 more than 2013 models) while the Hemi will set Summit buyers back $2,695. As is the case with the 4x2 models, the new 3.0L EcoDiesel V6 is available for the Limited and Overland models for $4,500 or for $5,000 for the Summit models. 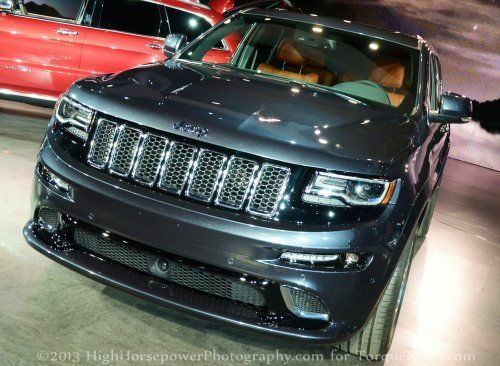 For those who are unclear, there are no engine options for the Grand Cherokee SRT. The entry level 4x4 model is the 2014 Jeep Grand Cherokee Laredo, which carries a base price of $30,795 and that is $1,100 more than 2013 models. Stepping up to the 2014 Laredo E in 4WD trim will set you back $32,495 and both of the Laredo models are only available with the 3.6L Pentastar V6. The 2014 Jeep Grand Cherokee Limited 4x4 starts at $37,795 - $1,800 less than the current Grand Cherokee Limited. In addition to the optional Hemi and EcoDiesel engines, Grand Cherokee Limited buyers can opt for goodies like 20” aluminum wheels, a luxury group, the advanced technology group, two different off road adventure packages, trailer tow group, a power sunroof and a variety of premium sound systems featuring the 8.4” touch screen. Next in line is the 2014 Jeep Grand Cherokee Overland, starting at a price of $45,995 which accounts for an increase of $2,000 from the current model year. Many of the options from the Limited models are available on the Overland except for the lower level off road adventure package (as much of that stuff is standard on this higher trimline). Also, Overland buyers can select the Quadra Drive II 4WD system that adds an electronically controlled limited slip differential package but if the buyer has already selected the box for the Off Road Adventure II package – Quadra Drive II is included. The 2014 Jeep Grand Cherokee Summit is the top of the line in terms of the non-high performance models and when equipped with four wheel drive, the Summit carries a starting price of $50,995. This is $3,000 more than the 2013 models but in addition to the new exterior features, the 2014 model should offer better fuel economy with every engine thanks to the standard 8-speed automatic transmission. The Summit models don’t offer many options other than the engines and a few basic things like the engine block heater and the rear entertainment package. Last and most certainly not least is the mighty 2014 Jeep Grand Cherokee SRT – a high performance SUV that starts at $62,995. This is $2,700 more than the 2013 SRT Jeep but the new interior gadgets and the 8-speed transmission are well worth the extra cost. The SRT model is the only 2014 Grand Cherokee powered by the 6.4L Hemi V8 with 470 horsepower and 465lb-ft of torque while also coming with some options that are unique to this high performance SUV. The dual panoramic sunroof, a pair of unique wheel options and the SRT high performance audio packages can take that base price up into the area of $73,000 for those who want the ultimate luxury sport utility vehicle in their fleet. While some may grumble about the increases in price across nearly the entire lineup, I should point out that every model will now offer improved performance and improved fuel economy measures thanks to the new 8-speed automatic transmission. That, combined with the various new features and the muscular new exterior design are well worth this minute increase and in the long run – the Grand Cherokee is still the most versatile large SUV on the market today.